DES MOINES, Iowa, August 24, 2015 - Ben Carson says that, despite reports, he has nothing against red meat. The retired neurosurgeon and Republican candidate for president, who reportedly embraced vegetarianism decades ago, denies that’s the case and says he actually enjoys a good meat dish now and then. Being a vegetarian can hurt a candidate among Republican voters, as the GOP generally has an unfavorable or neutral view on vegetarianism. According to a 2013 survey conducted by Public Policy Polling, 30 percent of GOP voters view vegetarianism unfavorably, while 38 percent view the practice favorably, and 32 percent are unsure how they feel about it. By contrast, 63 percent of Democratic voters have a favorable view of vegetarians and only 16 percent unfavorable. 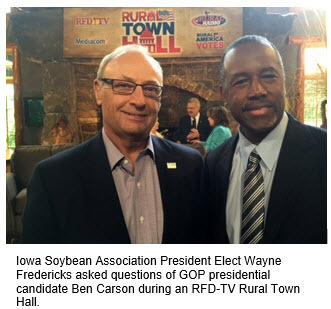 Carson told Agri-Pulse he doesn’t have anything against red meat and does eat it. Way back in 1990, Carson told the Vegetarian Times that he believed a meatless diet would eventually catch on. "It might take 20 years," Carson said. "But eventually there will no longer be a reason for most people to eat meat. And animals will breathe a sigh of relief." But back in Iowa, host of the first in the nation caucuses, Iowa protein producers represent a significant number of voters. Carson seems to be embracing the “full protein” menu, whether it be beef, pork, or even chicken and turkey. And he may recognize that these wonderful animals consume millions of bushels of corn and soybeans that are also produced in Iowa. Carson also said he favors food labeling, while not getting specific about labeling of genetically modified ingredients. In an interview with RFD-TV, Carson also didn’t get into specifics when asked what he would to do support pollinator health. He did say that he loved bees and was glad to see some American families starting to raise their own hives. “It’s a great hobby,” he said. To watch his interview on RFD-TV, click here. Carson was most specific when talking about immigration. Like most other GOP candidates, he said the country has to first seal the border. But he said it would be impractical and too costly to try to deport the 12 million or so immigrants in the country illegally. Instead, he said “we have to give them the opportunity to become guest workers.” He said that would require the migrants to register, pay a penalty and pay taxes going forward and would not give them voting rights or citizenship. He said such a program would be helpful to the agricultural and hotel industries.